What a year 2013-14 was for Northwestern sports. Not necessarily on the field, where team after team either fell short of expectations during the regular season or exited too early with devastating postseason defeats. In truth, no program soared above its projected results and captured campus’ affection like last year’s football team or lacrosse squads of years past. Even the Daily’s Team of the Year lost shockingly in the NCAA second round. But off the field, the headlines kept coming. Quarterback Kain Colter wore “APU” wristbands. The football team’s “Wounded Warrior” uniforms cause national controversy. Video of basketball walk-on James Montgomery III’s scholarship offer went viral. And of course, the union. Colter’s players union got the entire country (and all of our family dinner tables) talking about labor laws and the NCAA. A faction of The Daily’s sports desk fought to reward Colter’s trailblazing with our Male Athlete of the Year award, but eventually a national championship was too much to ignore. Congratulations to Jason Tsirtsis, Alyssa Leonard, all our award selections and all NU athletes who completed successful seasons. Thanks for reading along all year. Those would be strong words under any circumstances, but the fact that Tsirtsis was only four matches into his collegiate career made them even stronger. He had not even faced an opponent from the Big Ten, which Pariano often touts as the nation’s premier wrestling conference. But champions win championships. And Tsirtsis, a four-time Indiana state champion in high school, lived up to Pariano’s expectations in year one. He took home the national title at 149 pounds, defeating Oklahoma State junior Josh Kindig. Along the way Tsirtsis snagged a Big Ten title and was named the conference’s Freshman of the Year. InterMat also gave him national Freshman of the Year honors. With 32 wins in 35 matches, the freshman’s .914 winning percentage ranks No. 2 in NU history, only behind two-time national champion and four-time All-American Jake Herbert. A few months ago, Pariano’s words seemed unreasonably confident. Now they seem prophetic. 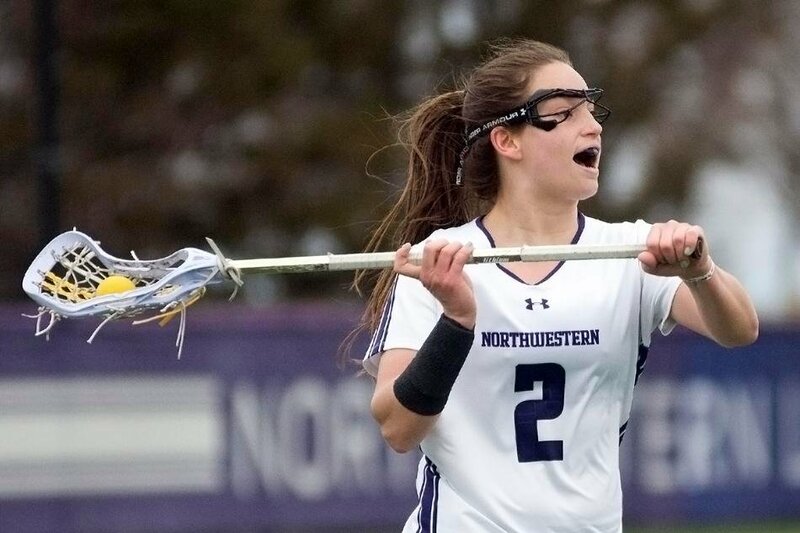 One of the more impressive players to come through Northwestern’s lacrosse program, senior Alyssa Leonard met her fate after dominating in the circle for three years and finally became the Division I all-time leader in draw controls on March 11. Her record-breaking 359th career draw control in that win against Michigan helped define Leonard’s legacy as the Wildcats’ infallible center, but this year was particularly noteworthy for the senior. She ended her final season with 469 draw controls to her name, including 163 for her senior season, which put her at third in the nation, seven spots ahead of her NCAA title-winning counterpart from Maryland, Taylor Cummings. The draw control specialist also ended the season as the team leader in goals (41) and assists (12). Leonard led the offensive charge when NU needed her most. It was Leonard who sparked a come-from-behind effort against Ohio State that kept the Cats in the ALC Tournament, Leonard who wowed the crowed with a highlight-reel behind-the-back goal at Wrigley Field, Leonard who gave NU the offensive possession they needed for a victory over then-No. 1 North Carolina. Leonard, at the end of the year, was the best player on NU’s best team. Northwestern (20-7, 10-1 Big Ten) continued its legendary winning ways this season with its 15th Big Ten Tournament crown in 16 years. Led by seniors Belinda Niu, Veronica Corning and Nida Hamilton, the Wildcats overcame many ranked foes and fought their way to victory in the Big Ten Tournament against Michigan. After losing to the Wolverines during the regular season, the Cats claimed a 4-3 victory behind an unbelievable comeback from Niu. Niu earned herself a spot in NU lore with the most wins for any individual on the team as well as being awarded the Arthur Ashe, Jr. Sportsmanship and Leadership Award. Niu, known for her clutch factor and going the distance against her opponents, garnered 27 wins with only six losses. Corning cruised to victory multiple times and upset numerous opponents throughout the season. A team captain, she earned her way into both the NCAA Singles and Doubles Championships. After falling in the first round of singles, she bounced back to win the first match of doubles alongside sophomore Alicia Barnett. This year, pressure always seemed to build up and fall on Hamilton’s shoulders. The senior routinely would have the longest singles matches and finish either fifth or sixth. Throughout the season, Hamilton only lost four matches and had 21 victories. It was a banner year for Northwestern’s field hockey program, which has established itself as one of the school’s best. Despite the loss of team leader Chelsea Armstrong, coach Tracey Fuchs led the Wildcats to a 15-5 overall record, 5-1 in conference. The team also claimed the regular season Big Ten Title after winning out the rest of the season after a loss to Louisville. Fuchs, the team’s fearless leader, has brought home win after win for the Cats. Before Fuchs arrived at NU, the field hockey squad won less than half of its games. Since Fuchs came to Evanston, NU is 66-35. Earlier this year, Fuchs became one of seven new inductees into the USA Field Hockey Hall of Fame. An accomplished player herself, Fuchs played for the United States field hockey team for 17 years, twice at the Olympics, four times in the World Cup, and in the Pan-American Games. Two hours into the average college tennis dual match, the outcome isn’t usually in doubt. By the time singles play is substantially underway, anyone with first-grade math skills can typically figure out which team has the upper hand. That’s what made April 27’s Big Ten Tournament final so exhilarating: Deep into the afternoon, the end result was anyone’s guess. When one team finally began to pull away, it wasn’t Northwestern. Michigan — who had handed the Cats their lone conference loss in the regular season— crept ahead 3-1, with three singles matches left to be completed. NU junior Lok Sze Leung pulled out a slow 7-5, 7-5 victory, leaving seniors Nida Hamilton and Belinda Niu needing victories to secure the Cats the title. Hamilton’s bout was tight, but Niu trailed 5-2 in the tiebreaking third set. By the time Hamilton prevailed 1-6, 6-3, 7-6, Niu’s comeback was underway. In front of a standing-room only crowd, the four-time all-Big Ten selection won five straight games, culminating in a dramatic final rally that clinched the Cats’ 15th Big Ten Tournament championship in 16 years. Niu screamed and jumped up, and the team embraced her in a giddy group hug. Some players dumped Gatorade on coach Claire Pollard, who afterward said the match was one of the best she’s ever been a part of.